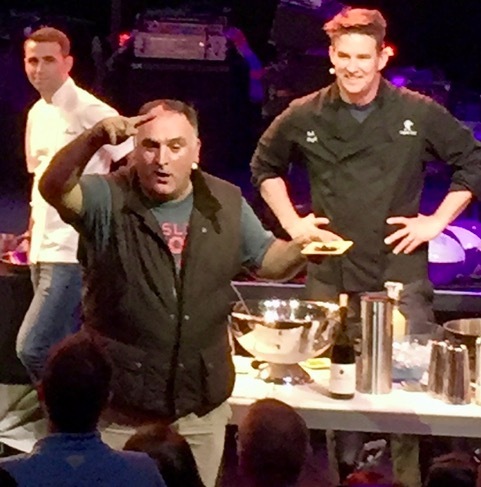 Superstar chef Jose Andres, who counts several Las Vegas restaurants among his empire, has become something of an angel of mercy in Puerto Rico. There’s buzz in the food industry personalities that the Spanish-born Andres deserves a Nobel Peace prize for his humanitarian efforts after Hurricane Maria devastated the island of 3 ½ million people in September. Andres has been at the forefront of preparing nearly 3 million meals. There are photos on social media showing four giant-sized paella pans that were so big they served 6,000 meals. Not long after Andres arrived on the island he had helped organize a team of volunteers who were cranking out 125,000 meals a day. FEMA has been paying him to lead the relief effort but he’s been critical of the slow response to the crisis. A well-known Las Vegas family once known for its donuts empire is celebrating a sweet victory in thoroughbred horse racing. The Winchell family’s most accomplished horse in five decades of racing, Gun Runner, captured the $6 million Breeder’s Cup Classic on Saturday at Del Mar. Ron Mitchell, 45, and his mother, Joanie, own 120 horses and 18 gaming taverns, including a number of Jackpot Joanies. Winchell Donuts was founded by Ron’s father, Verne, in 1948. The Winchells and their partners, Three Chimneys Farm, plan to retire Gun Runner in January after the $16 million Pegasus World Cup in Florida and put him out to stud. He’ll join a stable that includes the 2013 Eclipse Award winner Will Take Charge, the American champion three-year-old male horse. Another celebrity chef with local ties made news in the horseracing world this week. Celebrity chef Bobby Flay paid $1.5 million for a share of a 10-year-old mare named life well lived that’s believed to be in foal to American Pharoah, the 2015 Triple Crown winner and first Triple Crown winner since 1978. Flay has had the horseracing bug for years. Two years ago he bought an interest in Creator shortly before it won the Belmont by a nose. American Pharoah has quite the harem. He reportedly gets $200,000 in stud fees per year. A stallion of his caliber typically books 200 mares a year. The death of pitching great Roy Halladay in an airplane accident on Tuesday brought to mind a conversation I had with a Colorado Rockies pitcher in the mid-1990s. Big league scouts were showing up in scores to see Halladay play for suburban Arvada West. Such was the fascination of Halladay’s legendary potential. He was taken No. 17 overall in the 1995 big league draft, by the Toronto Blue Jays. I regret I didn’t join Holmes to see Halladay play. He went on to become an eight-time All-Star and two-time Cy Young winner. His two no-hitters came in 2010 when he was with the Philadelphia Phillies. The first one was a perfect game against the Florida Marlins. Adding to his reputation as a big-game performer, his second no-no came in his first post-season game, in the opening game of the National League Division Series against Cincinnati. He holds the distinction of being just the second player ever to pitcher a no-hitter in the post-season, joining the New York Yankees’ Don Larsen, who a had perfect game against the Brooklyn Dodgers in the 1956 World Series. Halladay was flying his ICON A5 plane by himself when it crashed into the Gulf of Mexico. Caesars Palace headliner Mariah Carey has had enough of her “Russian dictator.” That’s the nickname Carey gave to her controversial manager of three years, Stella Bulochnikov. According to multiple reports, Carey has severed the relationship. Bulochnikov, a former standup comedian and TV producer, was behind Carey’s reality show on the E! network, “Mariah’s World.” Bulochnikov was blamed for creating friction that led to Carey’s split with billionaire James Packer earlier this year after a one-year relationship. November 6, 1993: James “Fan Man” Miller interrupts the Evander Holyfield/Riddick Bow fight by swooping into the outdoor ring at Caesars Palace in a motorized paraglider. Fan Man suffered a seventh-round knockout when fans beat him senseless. The fight resumes after 30 minutes.